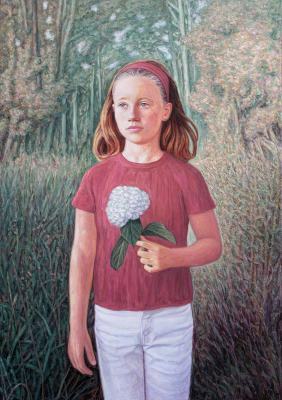 Centrality – The centrality of the human being in nature (of which he is a part); the young girl shown here is placed at the painting’s vertical axis. Dominion – The respectful dominion of man over this same nature, reflected in the simple attitude of this little girl, who has picked a flower for herself. Affinity – The metaphorical affinity between woman and the plant kingdom. Cf. The commentaries to the paintings Domestic Flora and Cyclical and Timeless Nature. On the dominion of the human being over material Creation: the world is unfinished and it is man who is capable of perfecting it, provided that he respects and upholds the natural order… although this same man may exercise a dominion which is abusive and destructive, like a buffalo that razes the earth in its path. Cf. The commentary to the painting Vestiges of Eden. above all, the beautiful, the immense joy of serving. planted, an enterprise to be embarked upon).